Nobody puts racking in the corner... Until now! Bring that dark, dingy corner of your garage to life! Utilise that corner space with a racking bundle to organize your clutter and give everything a place on the shelf. 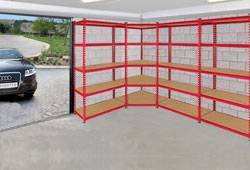 Our unique corner racking units are available in the T-Rax, Z-Rax and Aqua-Rax ranges. Formed of thick heavy-duty steel, with strong MDF boards, our warehouse shelving features rubber feet for stability and floor protection, along with four layers of powder coated paint to resistant paint to keep your racks looking great for longer. Our T-Rax, Z-Rax and Aqua-Rax shelves can hold an incredible 265kg of evenly distributed weight per shelf and is constructed using 1.2mm steel (much tougher than the 0.8mm industry standard).Each shelving unit can be constructed without the need for nuts and bolts using our innovative keyhole mechanism, allowing you to construct each bay in no time using just a rubber mallet. We offer free UK delivery on our warehouse and industrial racking, or, you can collect from our North Yorkshire base in York.